So many times have we hoped for a technology that could solve the problems of having to touch our laptop touchpads with oily fingertips, right? The keypads and mouse have already been replaced with touchscreens and touchpads, and we are now taking steady steps towards motion technology. Substantial efforts are being made to incorporate motion control into our daily lives to make them smoother and more manageable. Motion control isn’t just limited to the reel life of sci-fi movies today. We have already witnessed games like Xbox Kinect that is based on the same principle. Moreover, with reports suggesting that too much of proximity to computer and phone screens can actually be detrimental to human health, software engineers are trying to come to a solution that can help us maintain a safe distance from the machines. So what is Leap Motion Controller and how does it work? Developed in 2008, by David Holz and Michael Buckwald, the leap motion is a device that has been developed using the framework of gesture control technology. The Leap Motion controller comes as a peripheral device which you need to place on the top of your desktop or over a virtual reality headset. The device has two monochromatic IR cameras and three infrared LEDs which it uses to observe motion within the distance of 1 meter. The device lights up the space within the ambit of the cameras with infrared light and captures the points of the surface of the user’s hands and fingers. It then uses a complex algorithm to translate the data and estimate the position of the hand and the fingers. The LEDs reflect the motion points, and then the data is dispatched to the computer through a USB cable which is then translated using the motion technology. The device can track hand and finger movements in space and is generally used for better human-computer-interaction. The tracking precision is quite commendable when the motions are within the set range. The device has a standard deviation that is less than a millimeter, but the accuracy drops when the movements come from a greater distance. Another positive thing about the device is that its camera is strong enough to trace the motion of the occluded parts of the hands and thus can estimate some of the gestures effectively, thus providing useful tracking. Overall, the software is an average product that does what it says despite failing at times. While using the device, the one thing that you need to keep in mind is that you must keep your whole hands visible so that the device can trace the points and work up to its efficiency. While the Kinect could track whole-body within a spacious room, quite in contrast is the live motion that has a smaller observation area but a higher resolution. The controller can navigate a website, pinch and zoom gestures maps and high-precision drawing, and can manipulate complex visualisations using gesture recognition technology. The device is compatible with all three significant frameworks –Microsoft Windows, Mac OS and Linux. Since light plays an important role, strong sunlight or poor lightning can easily interfere with the tracking marked by the device. Moreover, as the controller’s action area is a mere window that is 150° by 120° wide and 80 cm in length, the device at times fails in performing without a break. Another major problem that you are likely to face while using the device is that it can be only used on the PC and no version has been developed yet that can work on mobile applications. However, developers are trying to come up with a future that can be used on a mobile based application. What are the applications of Leap Motion in the real world? Mirror Training is one such place where Leap Motion is being used to power robotic arms as warfare where the arms will be able to disable bombs and other emerging threats during wars. Although the robots that have been developed till now are quite slow, thus making the movement of the troops slow too, efforts to make the robot arms more efficient are being made. Works are on to replace the current robot-arms with Leap Motion controllers so that natural hand movements can be used to make it faster. The company is even trying to take the robot arms and employ them beyond the war zone. Quite soon the lea motion technology will be used for domestic bots that will assist teams on search and rescue missions too. With a noble cause, MotionSavvy is crafting a platform for the deaf people that will help them communicate with others around them and the company is using the Leap Motion technology to build a software that can recognise gestures and then translate the hand signs into speech right at the moment. The software comes in the form of a wearable tablet and has been priced at $600. Along with this, the company is also all set to introduce a smartphone case that can help the technology become portable. 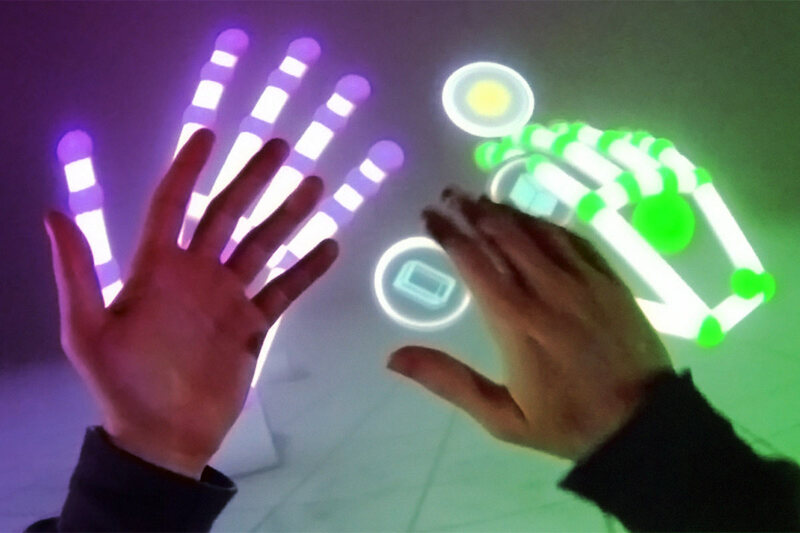 Ethereal has come up with a gesture-recognised software using the leap motion technology that allows artists to draw and paint on Photoshop without having to touch the screen or the hardware. This is helping the brand bring in more creativity from all corners of the world. Ethereal has also entered into a partnership with the online marketplace Skyou which is letting artists create customised t-shirts and backpacks by printing their work of art on them. Using Leap Motion to build an AR-based developer tool, GetVu is creating quite a stir in the business spectrum of motion technology. They have plans to come up with a headset that is powered by the Leap Motion controller and compatible with Android phones. The headphone lets its user interact with virtual objects. A funding program called the Indiegogo campaign has been launched by the company to raise funds for this augmented-reality based headset. Moreover, the startup is also welcoming capable developers to pitch in other project plans using the leap motion technology. With Leap Motion being applied in various other projects, all I can say is that the prospects for the technology are quite in favour. Developers are also making serious efforts to use the technology in imparting education to students with special needs. If the outcome turns out to be feasible enough, then the chances are that the special children will be greatly benefited. From taking an examination to providing automated assignment help, this technology could contribute to a better future. Although the applications till now haven’t been too disruptive, with considerable efforts being made towards a breakthrough discovery, all we can hope is that the technology can be beneficial in complicated areas like physical disability and warfare more and can be a boon to the humankind. Gracie Anderson is one of the many celebrated programmers in the country who acts as guest lecturers in several IT colleges. She is also associated with MyAssignmenthelp as an assignment expert she extends quality assignment help to budding programmers and developers. Besides being a gizmo freak, she loves to read.